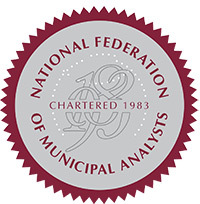 The National Federation of Municipal Analysts (NFMA) was chartered in 1983. It is a not-for-profit association with the goals of promoting professionalism in municipal credit analysis and furthering the skill level of its members through educational programs and industry communication, providing an informed perspective in the formulation of legal and regulatory matters relating to the municipal finance industry, and facilitating the flow of information between investors and issuing entities. Members of constituent societies are automatically members of the NFMA. In addition, individuals not located in proximity to a constituent society may join the NFMA as Affiliated Individuals or Associate member. The NFMA also has Student Membership. Membership in the Federation totals nearly 1,400, representing the major participants in the municipal market, including institutional investors, bond rating agencies, bond insurance companies, portfolio managers, investment banking firms and financial advisors. To join the NFMA, including any Constituent Society, Click Here.